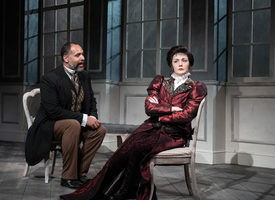 “A Doll’s House, Part 2” is an audacious extension of Ibsen’s 1879 classic, which is often considered to have portrayed the first stirrings of female empowerment. At the end of the play, Nora Helmer, a woman who feels suffocated in her marriage and her society, walks out on her husband and children, to find a more fulfilling life. When this sequel premiered last year on Broadway, it earned eight Tony Award nominations. From a 21st century perspective, playwright Lucas Hnath re-ignites the controversy the original sparked. His drama begins when Nora returns home after 15 years, banging on the door instead of slamming it. Beautifully dressed and obviously successful, she’s become a famous writer of novels that deride marriage and encourage women to pursue a more liberated lifestyle. The language here is modern, colloquial and rife with expletives. The times being what they were, Nora couldn’t use her real name on her books. Now her identity has been exposed, she’s being investigated, and she’s come to request a favor from her estranged husband. This gives her an opportunity to justify her actions, but also to face the harsh recriminations of her now less spineless nanny and husband, and her shrewd, calculating daughter. In a riveting 90 minutes, Hnath presents multiple viewpoints that resonate in both centuries. The characters, true to Ibsen, are complex and multi-faceted. The arguments are sound, and the outcome is beguilingly uncertain. The San Diego Rep has mounted an excellent production, with a strong cast centered by the superlative performance of Sofia Jean Gomez as Nora. The character remains fiercely free-thinking and high-spirited, but also self-centered and manipulative. Everyone here is self-serving, and each harbors an unsavory secret. With a sensitive touch, Sam Woodhouse directs a physically — but not emotionally — spare production, though I found the breaking of the fourth wall unnecessary. Still, you can’t help thinking how far we have – and haven’t – come, in terms of women’s rights. Or considering, as the characters must, the choices we make, and their reverberations over time. It’s delicious food for thought.